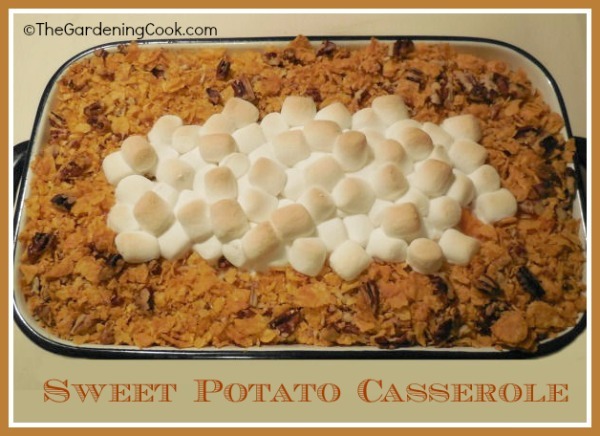 I was born in Maine and had never heard of this version of a sweet potato casserole until I moved to North Carolina. I went to a pot luck dinner at my daughter’s school and took one taste and said “what is this? It is delicious.” Everyone was amazed that I did not know what it was since it is such a popular dish in the south. What I like most about this sweet potato casserole is that it definitely has a sweetness to it but this is not overpowering. The granulated sugar with the sweet potatoes is the key. If you want it sweeter, then brown sugar is the way to go. Preheat oven to 400 º F. Line a baking sheet with parchment paper and cook the sweet potatoes until tender, about 1 hour. Cool and then peel. (You will not believe how easy it is to peel them if you do it after baking!) Reduce the heat to 350 º F.
Combine the crushed cornflakes, pecans and brown sugar. Stir in the butter until well combined; set aside. Beat the sweet potatoes with a mixer on low speed. Add the butter, sugar, skim milk, eggs, vanilla extract and salt. Beat until combined well. 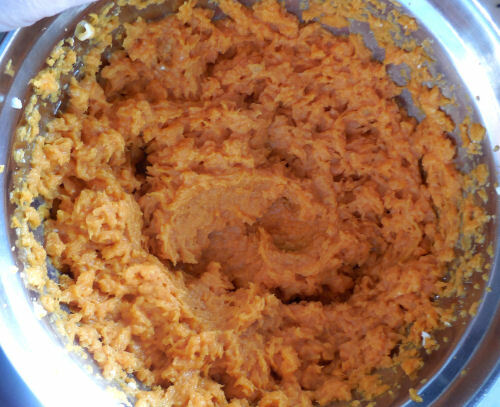 Add sweet potato mixture to the prepared baking dish. Sprinkle with the cornflakes mixture around the outside of the dish, leaving room in the center to add the marshmallows later. Place into the oven and bake until the topping is golden, about 20 minutes. Add the marshmallows to the middle of the dish and bake until lightly golden on top, an additional 5 minutes. 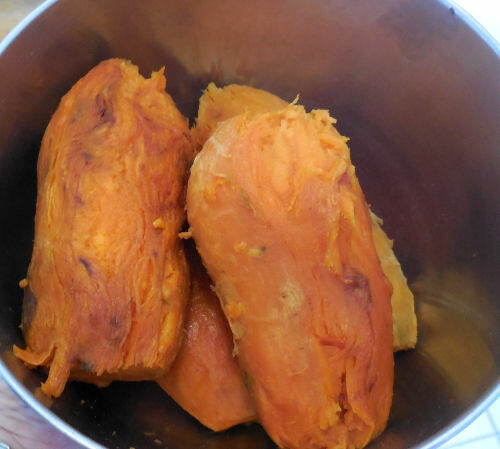 If you love cooking with sweet potatoes, try these Italian sweet potatoes. They are to die for! This classic Southern dish makes a great Thanksgiving choice to bring to tempt your family. Preheat oven to 400 º F. Line a baking sheet with parchment paper. Place the sweet potatoes onto prepared baking sheet and bake until tender, about 1 hour. Cool and then peel. Reduce oven temperature to 350 degrees F. Spray a 9 x 13-inch baking dish with Pam butter spray. 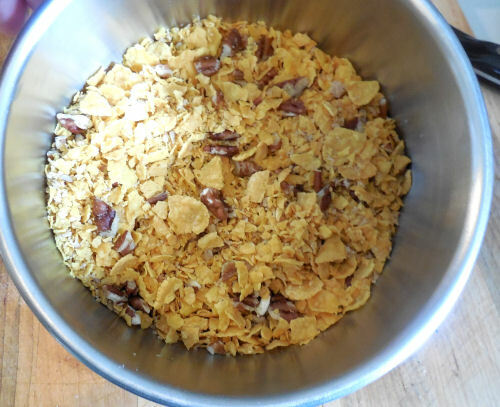 In a medium bowl, combine the crushed cornflakes, pecans and brown sugar. Stir in the butter until well combined; set aside. 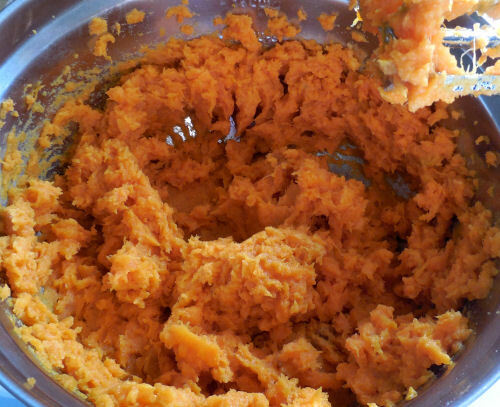 Beat the sweet potatoes with a mixer on low speed. Add the butter, sugar, skim milk, eggs, vanilla extract and salt on medium-high until well combined, about 1-2 minutes. 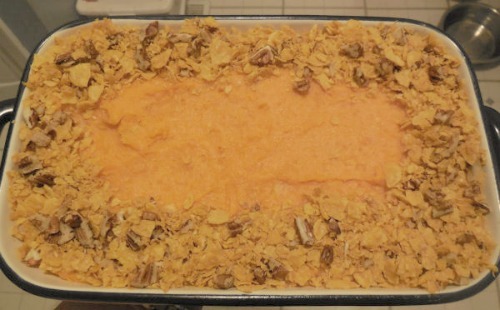 Add sweet potato mixture to the prepared baking dish. Sprinkle with the cornflakes mixture around the outside of the dish, leaving room in the center to add the marshmallows later. Place into the oven and bake until the topping is golden, about 20 minutes. Add the marshmallows to the middle of the dish and bake until lightly golden on top, an additional 5 minutes.